There’s nothing worse than a good idea. A bad idea is going to lead to a bad outcome no matter what you do to it. A good idea by itself may not fare better. It requires just the right decisions at just the right times or it will fall apart and that will be worse, because we can see and even empathize with how those decisions were made and suddenly we’re sharing in it. A disaster we observe is just a disaster; a disaster we take part in is painful. Power Rangers is frequently very painful. For people well versed in the myriad versions of the franchise over the (dear God) quarter century since Saban started it, Power Rangers has nothing to do with any of that. Its inspiration comes mostly from the Father – Mighty Morphin Power Rangers – and returns us to Angel Grove and its original slate of protectors: Jason, Kimberly, Billy, Trini and Zack. 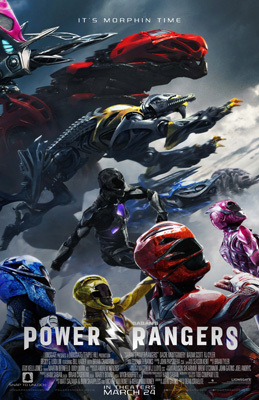 A disparate group of troubled teenagers they are suddenly faced with the responsibilities of adulthood and the attraction of belonging when they discover the crystals of the Power Rangers, an ancient group of intergalactic protectors, and are given superhuman strength and durability. Now they’re the only protection Angel Grove, and the world, have from Ranger-gone-bad Rita Repulsa (Banks) who wants the power crystal buried beneath the town. But first they’ve got to figure out how to stop being kids and start being Power Rangers. A group of multi-colored armor wearing teens who kung-fu anonymous bad guys before climbing into their giant robots to fight giant monsters is great for kids television. It’s a bit more difficult to turn that into wide-appeal big screen fare. The four producers and five screenwriters who have labored to figure working to thread this camel through that needle have landed on the novel idea that Power Rangers should be less about the armor and robots and more about the kids inside them, which is great as far as it goes. Pulled together by Oscar-nominated screenwriter John Gatins (Flight) and director Dean Israelite (Project Almenac), this iteration wants to hone in on what would make a teenager want to do this, and what would stand in their way. Jettisoning the well-behaved, straight-laced characteristics networks require from kids’ show protagonists, the filmmakers have instead developed the kind of outcasts and underdogs which play much better with the general public (because who doesn’t feel like an outcast at some point?). Rather than just rest on clichéd laurels and use the archetypes as a platform for stunts and gags, cast and filmmakers spend most of the film developing these kids, explaining what makes them who they are and why we should care. While there is certainly a fair amount of archetype mining (Jason is the star football player acting out against a stern father and the idea of a life pre-planned for him), there is also quite a bit of undermining, from Billy’s re-imagining as a semi-autistic dealing with the death of his father to Kimberly as a cyber-bully who hates the fact that she is one. Gatins and Israelite also invest a great deal of visual and actual humor. It keeps the emotional moments from being too on the nose and often genuinely funny (this is surely the first Power Rangers anything to begin with a cow masturbation joke), though Israelite is too wedded to a handful of visual gags which he uses over and over. Though the actual Power Rangering takes a back seat to much of this (the action adventure elements are relegated entirely to the film’s final 20 minutes), there is still only so much which can be squeezed into a film’s running time. Even cutting supporting characters to a minimum and using them as plot-focused flavoring, five Rangers are a lot to introduce and develop. The film is primarily focused on the troika of Jason, Kimberly and Billy, who have by far the best chemistry among the young actors (and are generally all excellent). Trini and Zack are introduced almost as an afterthought, as if someone suddenly realized there were five rangers so they really needed five characters. But even they get their moments, with much of the second act devoted to the five opening up to one another as they train to be Rangers. It’s funny, revealing, and generally well done. All good things must come to an end, though; or in this case a beginning. At some point a Power Rangers film must become about the Power Rangers and almost everything Power Rangers-like in the film is awful. Some of it is classic ‘what were you thinking?’ bad. The instances of Ranger mythology being inserted into the dialogue are thankfully slim, but the bone is thrown for the fans and it really shouldn’t have been. Laurence Olivier couldn’t imbue ‘it’s morphing time!’ with enough gravitas to keep from sounding silly, much less Montgomery. Brian Tyler’s generally competent score has the same problem the one time he transitions Shuki Levi’s old theme. Whenever Power Rangers gives up on evoking the old show and tries to cite it directly, it stumbles. The really bad stuff, however, are the bits where we can see where the filmmakers were coming from and we can even see ourselves making the same decisions ourselves… but the outcomes are not good. The filmmakers (and you would be hard pressed to pick an actual author of the film – take that auterists! – but if I had to guess I would say Gatins more than anyone else) have had the good idea to take the piss out of the Ranger thing a bit in order to make it go down better. But that means walking the tight rope between being just jokey enough to keep self-seriousness at bay, but not so much you become actively silly. [Thankfully no one saw any need to include Bulk and Skull or similar hijinks in this, Alpha is obnoxious enough himself]. The first time the group combines, all their robots come together into one giant robot and they strike a very cool pose… and promptly fall over because five people jointly piloting one robot is a lot harder than it sounds. This is good. But then they keep going. The McGuffin everyone is after is buried under the town Krispy Kreme, which probably was funny when it was first dreamed up. Rita silently eating a donut in the middle of the big battle is literally the only worthwhile thing she contributes to the entire film. But once the joke is introduced they’re stuck with it, leaving the actors stuck saying things like ‘we have to protect the Krispy Kreme at all cost!’ as sincerely as they can. It’s not funny, it’s not ironic, it’s silly. A big part of that is because the Rangers themselves, whose charisma and chemistry have been driving things until the end, spend the last twenty minutes trapped inside their robots trying to look involved in the action rather than removed from it and failing. The idea is people like watching big robots smash things, but unlike say Transformers, the robots aren’t characters they’re just mechanisms, leading us to many close-ups of the actors pushing buttons and pulling levers with urgency but no longer connecting with one another, and leading the filmmakers to over compensate. Israelite removes the costumes’ classic faceplates so that we can see the actors faces and connect with them more, but the look of that is extremely off-putting and has the opposite effect. It doesn’t help that the often fun dialogue of the first half of the film is replaced with clunky one liners which aim for cool but land on stupid. A bad Power Rangers film wouldn’t be the end of the world, it certainly wouldn’t be the first (and the less said about the two previous attempts the better). But for a few moments the new film was against all odds good, balancing many conflicting pieces with ease. The fact that Power Rangers couldn’t keep it up is worse than if it had been a disaster from the beginning.